I was in a local craft store last week and it was all deck out like Christmas was here. I'm sure this is happening where you live too. To be honest I kind of feel bad for the employees of those stores, they have to deal with Christmas overload for 5 months before it really truly is the Christmas season. It must throw them off a bit. And, while I feel bad for them, I couldn't help but wonder if people are already gearing up for the holidays? I mean, do those $500 fake Christmas trees at Hobby Lobby really sell in August? Seems odd. The whole idea has made me curious, are you an early shopper? Do you shop for Christmas presents and decorations in August? My niece starts early on her gift shopping and is usually done by mid-September. I like that idea, it seems budget friendly and on-the-ball but it's really not me. There is something about waiting until the 90 degree temps are long gone before I start Christmas shopping. I like that. I like shopping in sweaters and even snow. While I may not shop early, I do like to dream up decor ideas and make ornaments. Case in point, I made the ornament above last week. It's August and snow was no where to be found, instead we were having heavy rain and a tornado watch but I enjoyed making it anyway. Do you want it? I'll happily send it to one of my readers. Just tell me two things: When do you start shopping/creating for Christmas and if you'd be interested in seeing a tutorial on how to make the ornament. I'll take comments until Friday, August 9th. And be sure to leave a way to contact you - I've had giveaways before where the winner never claims their prize because they didn't leave a way for me to contact them - so sad - don't be that person. My husband and I already started shopping for Christmas. We have 2 birthdays in December and one in January. So we always start early. Yes I would love to see your beautiful Christmas ideas that way I can try to do them myself. Christmas shopping is done nearer to Christmas although I understand the logic of shopping early. Waiting until the 24th is out of the question though! I also prefer making gifts as they truly come from the heart. As a professional procrastinator, I don't start until the weather chills. To learn to make a new Christmas ornament would be great - an item to add to the bow on the heart-made gift. I don't start anything Christmas until after Halloween. Poor Thanksgiving kind of gets the shaft, but I refuse to start buying gifts while I'm still hanging skulls and witches everywhere! And I love your tutorials so ... yes! I have shopped, and I have created, but I need the pressure of a looming deadline to get it all done! I would like a tutorial as well! Oh,in fact i don't start anything Christmas until after Halloween. Im awful...I dislike Christmas so much I wait till two days before to shop! yikes...and the Christmas at hobby stores now makes me ill!! I would LOVE a tutorial! I'm like you, I want cooler temps before I start shopping for Christmas. Here in Louisiana those are hard to find even during the normal holiday months much less August! I'd love to see a tutorial because snow is what I miss the most and like the sentiment says...I love snow! I can be contacted at julannekowalski@me.com if I'm fortunate enough to win the ornament! Mary L: I shop year round for Christmas. Crafting - well, maybe not so early but we have a group of 10 girlfriends who do a craft exchange every year in December so I'm always on the look out for cut ideas and you've hit it right on with this darling ornament. Of course I'd love to see a tutorial on making it. Who knows - it could be my gift I give at the craft exchange. The day after Christmas I start for the next year. I start with the ornaments for all my grandchildren which I make every year. Then I start watching the ads for ideas on presents. I usually am done with the shopping part by oct. and the making part in nov. would love a tutorial on the ornament as I make new ones every year for 13 grandchildren. 1. Yes, a tutorial would be awesome! We are exchanging hand-made gifts this year with one side of the family. These would be super cute to make & give. 2. Shopping doesn't begin until November. If I start too early I overbuy, I keep finding & adding gifts as the holiday approaches. I do begin crafting & cardmaking throughout the fall months. This allows me to focus on baking & decorating in December. I enjoy your blog & appreciate the time & energy it takes to make it fun for us!! Thank you! I am thinking about Christmas all year long so July isn't too early for me. YES!!! I want to see a tutorial for this darling ornament. Thank you!! I'm like Joann above. I do some shopping earlier in the year, but 90% gets done in December. That snowman ornament is so cute! I'd love to win it, but I'd also love to see the tutorial. My daughter and I had a lot of fun making some of the ornaments you featured last year. We start as soon as we see something special for a family member. My hubby has started purchasing for this year. I haven't yet but am looking at crafts that must get started soon. I'd love to see a tutorial on the ornament. For the first time ever I have already started making gifts! I am excited, three down. I would love to see a tutorial on this ornament. Love your blog and your jewelry! I would love to see the tutorial!!! I start shopping in Oct. and crafting as well with new decorations and whatever homemade gift I am choosing to make for my friends and family.. love your blog!!! Hi, I would love a tutorial of the ornament. I dont shop til about October unless something jumps out at me for a particular person. I love to decorate for Christmas but will wait til after Thanksgiving but will start crafting early. I usually start my shopping just before Thanksgiving, avoid Black Friday like the plague and end up getting a lot of stuff on line. I'd love to learn how to make this ornament! I saw this cute little guy last night when I brought one of your chevron pendants. I almost brought him for my daughter, who collects snowmen. You can't help but smile when you look at him! So-yes, I would love to win it! We usually wait to shop for the big Christmas presents when my husband gets his bonus check in the 2nd week of December. But I am always on the lookout for gifts when we go to craft shows. I have saved your nativity tutorials from last year. I would love to make some of those for presents. But yes, would love to see the snowman tutorial-that would probably be a lot easier to make! my sis and I paint christmas ornaments for family and the only time we can get together to do it is JULY! after that I get a little crafted-out and I have to wait until October to do any serious Christmas creating or shopping. ...darling ornament... I would love to see how you made it. I have already started shopping for christmas. I make christmas items starting in sept. I think your ornament is a beauty and would love to see a tut. I have already started to make gifts for Christmas))))I'd love to learn how to make this ornament! I only start my Xmas shopping in November or December! I havent started making anything Christmasy yet but I would love to start with your tutorial! It is sooooo cute! My family swaps names at Thanksgiving, that way we can get someone a really nice gift they really want instead of stretching your money over two many people. I generally don't put up my tree and decorations until after Thanksgiving either. That's when the Christmas music gets to come out to. After working retail for years I just feel that if its not for just a short time, it loses it's specialness. I would love a tutorial on him, I just love snow people! I like to start creating early, but usually don't start shopping for store bought gifts until the fall. I would be interested in seeing a tutorial for your ornament. What a darling ornament! If he would like to come live at my house he would be most welcome! He would fit right in with my snowman collection. A tutorial would be great. I've never worked with clay before, and I'm sure my teenage daughter would be very interested. As for Christmas shopping, I'm always afraid of buying something my kids can't live without only for that to change the month before Christmas so I usually hold off on them. And I'm not generally in the Christmas gift mode of thinking much before November anyway. Oops, forgot to leave my contact info! mills.sgm@gmail.com It's so generous of you to share your creations!! I usually start Christmas shopping and creating by the end of October. I pickup little things throughout the year. yes! I'd love to see a tutorial!! I am constantly on the look out for Christmas. I keep a list of hints given, so I know I'm on the right track. YES! I love a tutorial of this darling ornament! I really don't start shopping until Black friday... I like to shop when the Christmas season begins. I would LOVE a tutorial on your ornaments. I have an ENTIRE tree dedicated to just Snowmen ornaments! Although I'm not a fan of SNOW, I do LOVE Snowmen! I also enjoy your jewelry tutorials so much. Hi Amy. I am so addicted to Then She Made. I don't remember how I found you, but, I have creeping on a regular basis for about a month. I would love to start shopping now, but, I do good, just getting my kids back to school. I am going to try to begin shopping the later part of September. I would love to see your tutorial on this. I have always wanted to try clay and this would be perfect. Thank you for all of the inspiration. Rhonda @ The Messy Roost. Every year I tell myself I'll start planning/shopping for Christmas in September but, hey! It's end of november already and I haven't done a thing! So, yes! I'd love to see a tutorial on how to make the ornament. I usually start in August or September to shop. I would love to have a tute for the ornament. I'm just getting into clay. That's a cute ornament and I'd love to win it! Or learn how to make it. I have always shopped year round for gifts for several reasons: 1. I don't have to spend so much all at once. 2. I get a better price if I buy on sale. 3. I buy something when I see it because I may not find it again. And I tend to make Christmas ornaments/decorations well before Christmas to avoid the last minute rush of too many things to do. And I usually buy my supplies for next years Christmas crafts right after Christmas when I can get them for 75% to 90% off. Since I save ideas all year for what I want to make, I'll know what supplies I will be needing for them. I can even remember a few times when I bought gifts for the NEXT Christmas the day after Christmas because I knew they were perfect for the recipient! For me it's all about giving meaningful gifts - and you don't usually find them at the last minute. That ornament is sooo cute! I love snowmen! Thanks for sharing it, and all you do to make this blog great! I think I first discovered you when you posted your cute sock snowmen. I too have made similar snowmen in the past, but yours are just adorable. Then i discovered Pinterest for awhile and quit reading blogs as often, but now I'm back-just in time to see google reader close down-boo. I learned to shop early watching my husband who used to be done shopping by August. But I usually don't start crafting til September when the weather starts to cool. There's just something about fall that says its time to create. Besides, summer here in Wyoming is often so short, we have to enjoy it while we can. I'd love a tutorial. 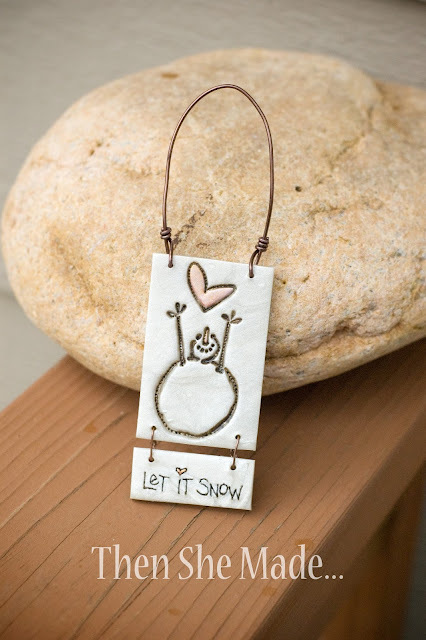 I have plenty of snowman stamps to choose from to make an ornament like this-if a stamp is what you used. amandalsmith75@live.com Thanks again!!! This is adorable! I am not the crafty type though without a lot of help from an expert :) So, yes I would love to see a tutorial because any help for someone like me would greatly be appreciated! I don't start buying gifts before november but I think about presents a long time before. Sometimes, I even buy on the 23rd of December! It depends on the occasion, if I find something not previous during my holidays or my shopping. For the tuto, I'll love to see how to make ornament! I give a quick look at your blog every day in order to see if there's something new and I wqnt to thank you for all you show us. I start thinking about gift ideas in October. Go shopping the week after Thanksgiving. Never shop on black Friday unless it's online. Yes a tutorial would be great! I start shopping shortly after CHristmas for the next one. Of course much of what I buy I use for birthdays and such. Gotta love a sale. I would love the ornament and also the tutorial to make others. Thanks for your creative mind and sharing. I adore your little snowman ornament! I have a dear friend that I would gift him to if I win! I'd also love to see a tutorial...thanks! I shop for gifts for Christmas & all occasions as I see the perfect thing for that person. Over the years my gift list has gotten smaller, so I know exactly what each person likes. I also make most of my gifts...but shop on Etsy for other handmade stuff, too. You should be able to get in touch with me through my blog, but just in case, my email is ohkitten@cox.net. Thanks for the fun giveaway! Snowman! OMG! Snowman! I adore snowmen and have a few things here and there. Yes! I'd be interested in a tutorial! I/we don't normally shop for Christmas or give gifts; but, we do put up a tree and decorate a little. I no longer have anyone to buy Christmas gifts for (other than myself). Very sad for me. When I used to buy I did it all year especially for my sister - she collected turtles and I would pick them up as I saw them - for birthdays and Christmas. For Mom and Dad, usually during August at the Canadian National Exhibition (CNE)in Toronto. As far as crafting for gift-giving, usually throughout the year for all the special holidays. As for Christmas, though, usually after our (Canadian) Thanksgiving in October. Haven't really done crafts in a long time but since I've started following blogs (two years) I'm getting the itch to start again. P.S. Yes I would love to see the tutorial for your fun snowman. Through the year, I keep a running list in my iPhone of Christmas gift ideas for each person. In October, I pick the best ones and order everything from Amazon. I'd love a tutorial on the ornament. I'd like to make some small, non-holiday ones with the name of each family member to hang among the framed family photos on the wall of the stairwell. Thank you. Just found your blog and will subscribe! If I win, I'll contact you! For sure! A tutorial would be fabulous, thank you! Hmmm... I usually start shopping for Christmas in late September/early October. At the least, I've made my list by then:) Of course I would love to see the tutorial for the ornament - I'm always looking for handmade things!! I usually procrastinate and don't start shopping for Christmas until the middle of December ... or a few days before Christmas! I would love to learn how to make this. Thanks! I start crafting the day after Christmas for the following year. I love finding that 'perfect' gift for each of my recipients. As a result on my year around crafting my craft room is always a total wreck but I love it. I would love to see a tutorial on how you made that darling little ornament. Love your site. (765) 546-1816 call or text. Thanks!!!!! This is a little early for me to start shopping. Our grandchildren could change their minds ten times before Christmas. I do on the other hand start sewing for the holidays. I've started shopping. I have 6 adult kids and 7 grands to buy for so I always try to start early. I would love to know how to make this ornament. Thanks.